B' e peantair às na Tìrean Ìsle a bh' ann an Vincent Willem van Gogh (IPA: /vɪnsɛnt ˈʋɪləɱ vɑŋ ˈɣɔχ/, Zundert, 30 am Màrt 1853–Auvers-sur-Oise, 29 an t-Iuchar 1890). An dèidh dha feuchainn, agus dèanamh glè dhona, seòrsa air leth obair rinn e an àird inntinn a làmh a chuir ri ealain agus lì-dhealbhadh agus mar sin ghluais e gu Paris còmhla ri a bhràthair, Theo, a bha ag obair a reic dealbhan agus a thug toir cuideachadh agus taic do Vincent. An deidh greiseag ghluais e gu baile den ainm Arles còmhla ri lì-dhealbhadair eile, Paul Gauguin. Bha an dithis aca ag argamaid gu tric agus gu mòr agus mu dheireadh gheàrr Vincent cuid a' chluais aige dheth. 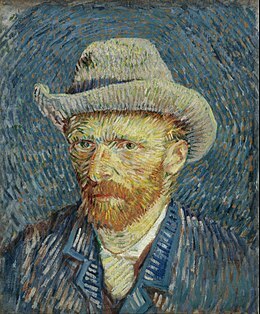 Dh'fhàs na trioblaidean aig van Gogh cho dona agus gun deach a chuir gu taigh-chaoich far an do chuir e fhàs dha fhèin an deidh dà latha. Bhàsaich Paul Gauguin dreis ghoirid an dèidh sin le bròn. ↑ “Van Gogh’s Life, 1853–1890”. Taigh-tasgaidh Vincent van Gogh, Amsterdam. Air a thogail 29mh dhen Iuchar 2018. ↑ Willsher, Kim: “Van Gogh and Gauguin letter tells of artistic hopes that turned sour”, The Guardian. 23mh dhen t-Samhain 2012. Air a thogail 29mh dhen Iuchar 2018. Air a tharraing à "https://gd.wikipedia.org/w/index.php?title=Vincent_van_Gogh&oldid=543240"
Chaidh an duilleag seo a dheasachadh 29 dhen Iuchar 2018 aig 15:57 turas mu dheireadh.